With just a short drive, you can escape the summer heat of Atlanta and unwind on a river trip! 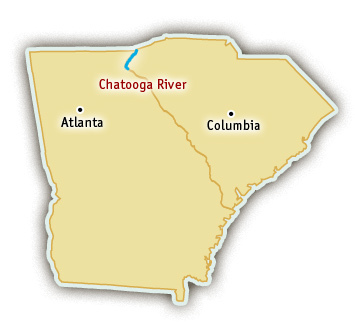 It’s true—Atlanta is close to two excellent options for whitewater rafting: the Chattooga River and the Ocoee River. Both rivers offer exceptional scenery and a variety of trip options. Chattooga River trips start near the town of Clayon, Georgia, only a two hour drive from Atlanta. The whitewater season on the Chattooga River typically runs between March and October. However, since this is the longest undammed river in the southeast, flows can vary depending on rainfall. Rafters can choose between several different sections, ranging from mellow Class II to thrilling Class IV, which makes the Chattooga a great choice for family trips. This is a river with options! For those who want a short trip, it’s possible to do a quick three-hour float and be back to Atlanta the same day. Or, rafters can camp under the stars and relish in a two-day river trip. The Chattooga River is a federally-designated Wild and Scenic River, which means you’ll experience amazing scenery, solitude…and a dash of adventure. The Ocoee River is the other easy option for whitewater rafting near Atlanta. River trips start near the town of Ducktown, Tennessee, approximately two hours from Atlanta. Rafters typically float one of two sections on the Ocoee. The Middle Ocoee run is five miles, Class III-IV, and is one of the most popular whitewater runs in the country—perfect for adventurous families. The Upper Ocoee run is five miles, Class IV+, and is ideal for adults and older youth seeking a more thrilling experience. The runs can be combined into one action-packed 10-mile day. No matter which section you choose, expect to be thrilled with near-constant rapids as you float through the Ocoee’s beautiful natural gorge. The Ocoee River is dam controlled, which means water is stored upstream in a reservoir and released on a predictable schedule—that’s good news for rafters because there’s high water all summer long! The river has reliable rafting flows from March through November.